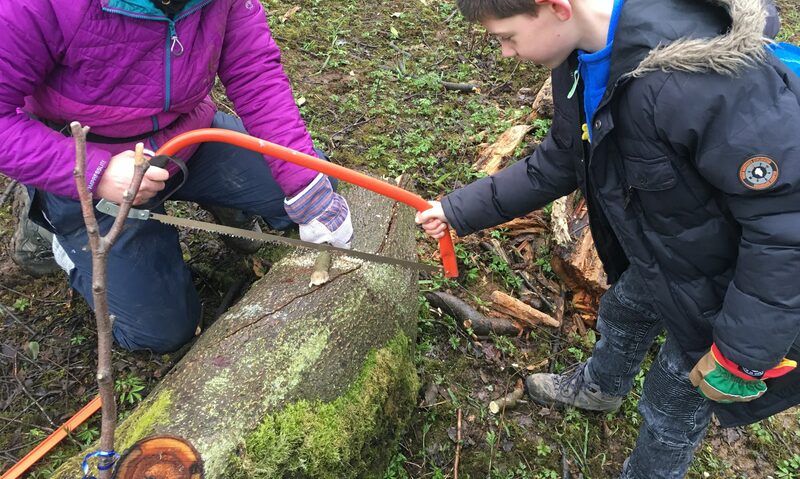 The Yorkshire Dales National Park recently invited us to try a forest school session with them at Freeholders wood in Aysgarth. 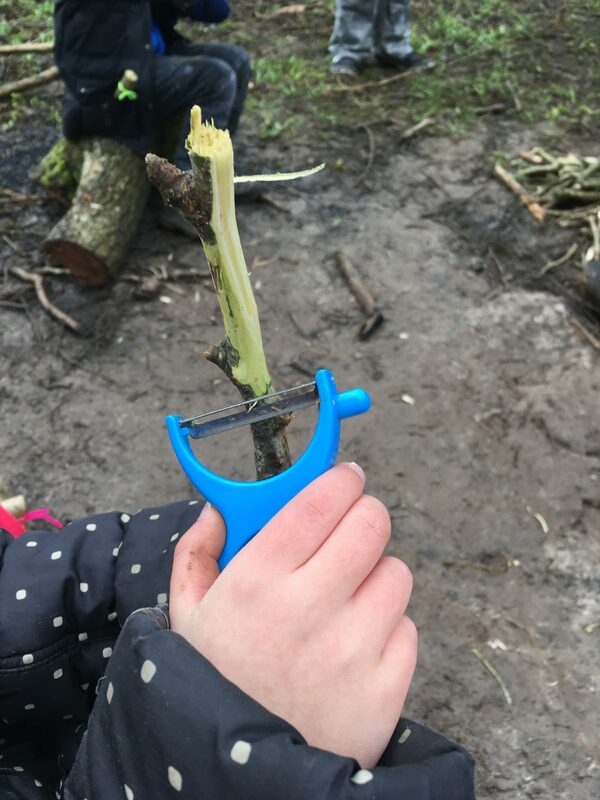 Both children have enjoyed any sort of bush craft we’ve had a taste of before, so I was looking forward to seeing what a mornings session would be like. On a soggy morning in the Easter holidays we met Kirsten from the forest school, and another Blogger and her family. My eldest known affectionately as Mountain Goat or Stick Boy had brought his pet stick along for the fun too! We made our way into Freeholders Wood and into a coppiced clearing where we found big logs to make a seating area. Kirsten then gave the kids choices about how they would like to spend their time and what they might like to do. 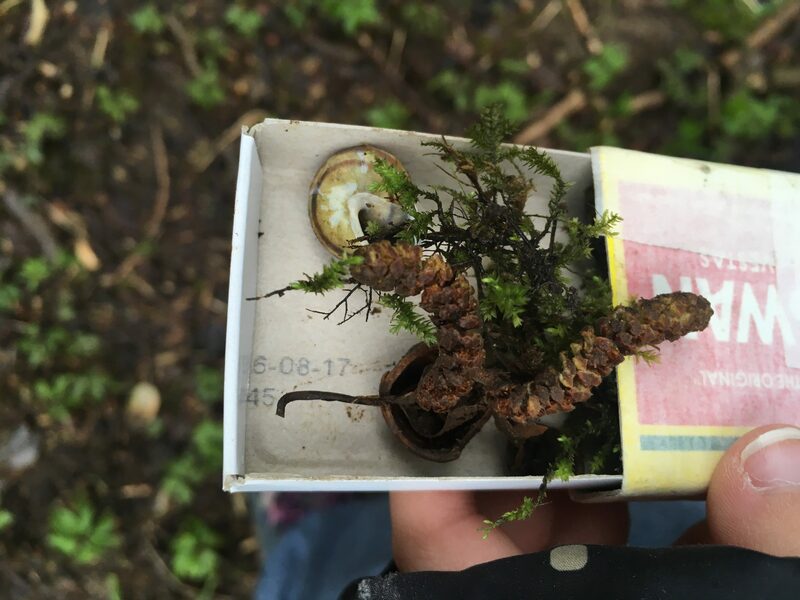 We started with a treasure hunt and filled matchboxes with what we found around the wood. Stick Boy found a few mini beasts and my youngest was thrilled to find an old snail-shell. Kirsten talked to us about the animals in the area and showed us the leftovers of some nibbled nut shells. I was fascinated to learn that squirrels can be left or right-handed. Wow! You can tell by the way they eat pinecones and which way it has been turned. I know what I will be on the lookout for now! The children could then choose to make a nest or a musical instrument and all went for the musical instrument option. We hunted around the wood for suitable sticks to use, Stick Boy in his element. He was so excited to get his hands on some proper tools. Very patiently and bravely(! 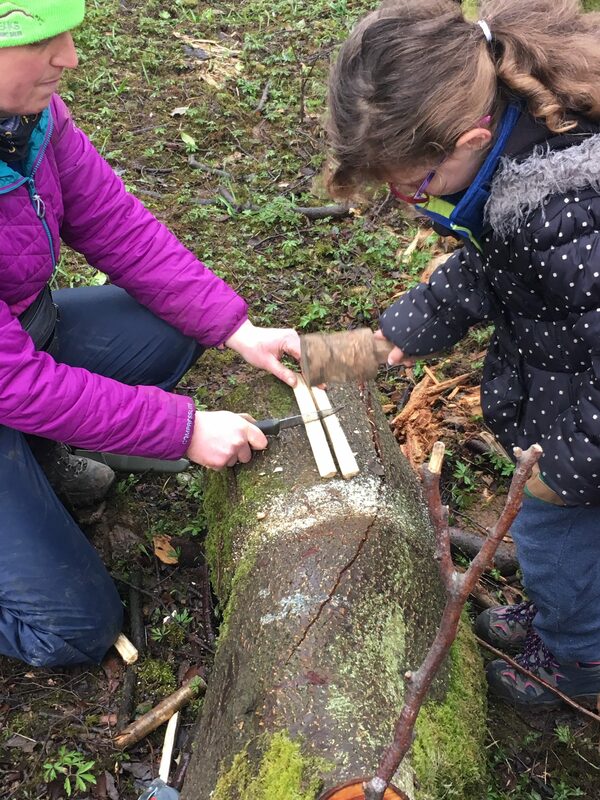 ), Kirsten helped the children saw and split the wood, make grooves with a knife and turn their sticks into a kazoo. The children aged from 3 to 10 years old were all given the opportunity to try something. After that we gathered more sticks to make the camp fire and some tools to toast things on. 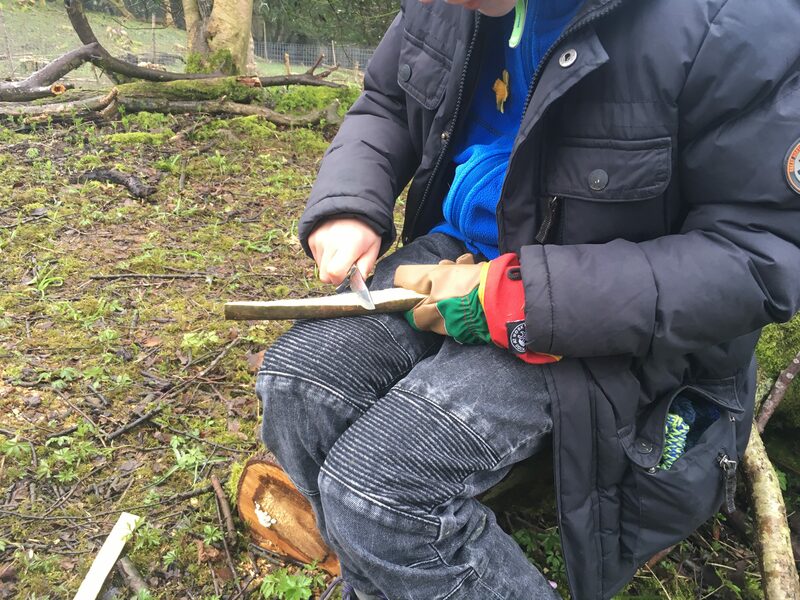 We all had a go trying to light the fire with a flint and steel and then keep the fire going once we had a flame. The children had made toasting sticks, and all had a go at toasting halloumi, croissants and muffins. It was great fun, even if we did lose a few bits of cheese in the fire. The morning was finished by making popcorn, which my youngest sadly dropped, and then roasting the marshmallows. 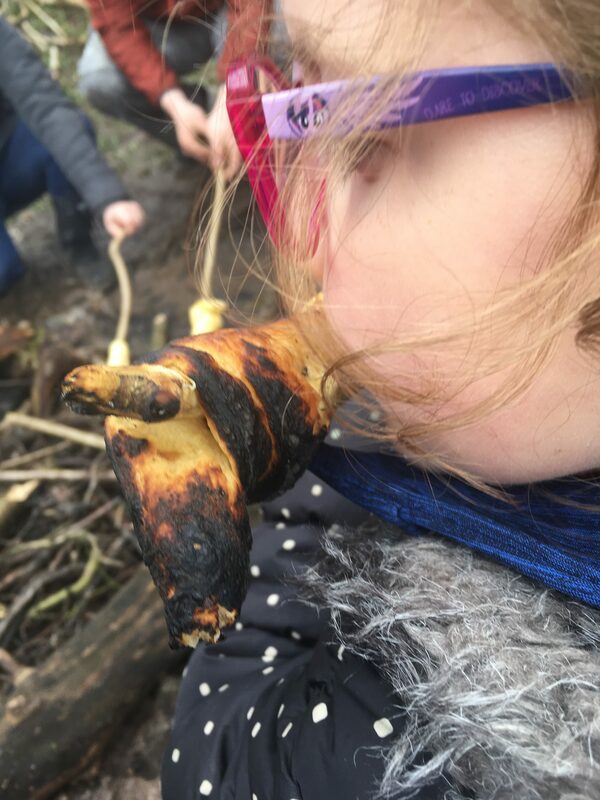 We really enjoyed our forest school session and came away a bit muddy, smelling of camp fire and the pet stick had a few more friends to go home with. My children have great plans to try their new skills in our garden. 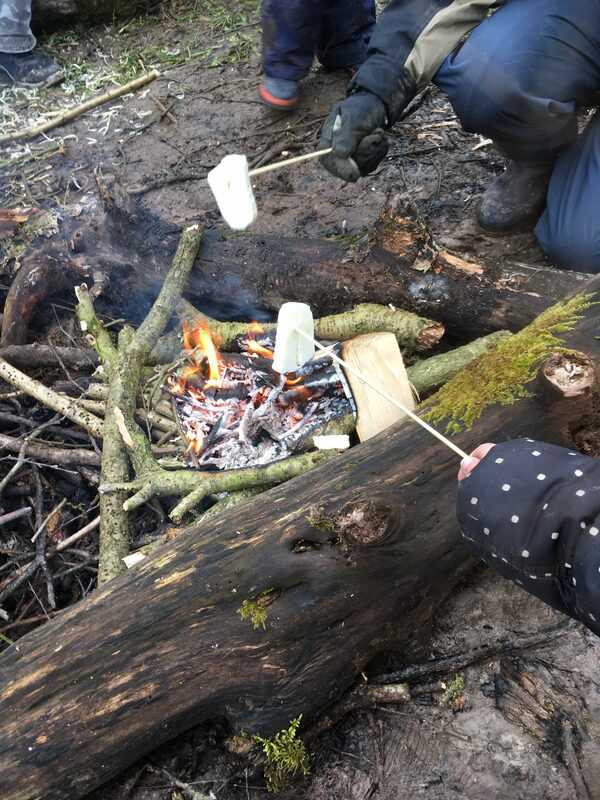 The Yorkshire Dales National Park have different events going on throughout the year, for more information and the next forest school event check their website. The age range is usually for 3 – 12 year olds, although sessions can be tailored up to the age of 16. Cost is £5 per child and adults are free. We were guests of The Yorkshire Dales National Park, however all views are honest and my own. It was brilliant and even with the wide range in ages they all had fun. Hopefully it will become even more popular. This sounds like a great experience for kids and adults alike. 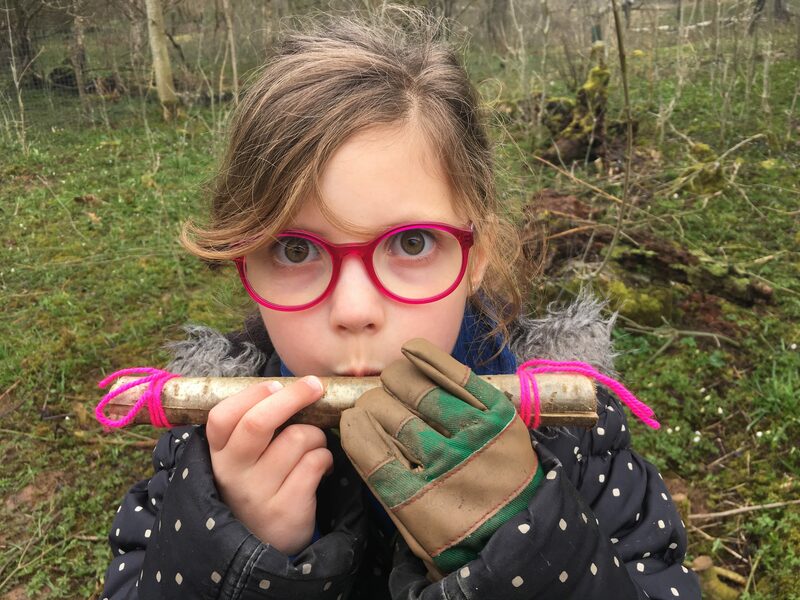 I love forest schools and would dearly love to learn more about bushcraft myself (I know very little in all honesty) so I’ll definitely look out for similar events local to us. Thanks for joining us on #adventurecalling. We’re back open in the morning for new posts. The kid in me enjoyed it too! Hope you find something similar near you. It was so much fun, even the big kids (me!) enjoyed it. Everyone I’ve spoken to whose had a forest experience, has said the same about the kids getting something from the sessions. I hope it encourages more forest schools, good luck hope you find one for Finn. I think my kids really got a lot out from it. Hope you find one near you!